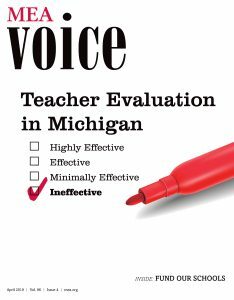 MEA tools and training can assist members in navigating the teacher evaluation system. A training cadre is available to visit local associations to deliver the latest information about the law’s requirements and specific state-approved tools used by local districts, and to provide access to Michigan Department of Education resources related to evaluation. The training includes methods for educators to take ownership of their evaluations and ensure they are utilizing and documenting best practices in their classrooms. “It’s become apparent that the teacher has to be proactive in ensuring they can demonstrate and document good practice, because it isn’t something that necessarily will be observed in the 10 minutes that the administrator is in the room,” said UniServ Director Tammy Daenzer, the lead trainer in the cadre. In addition, the training emphasizes the need for union leaders and members to establish a collaborative work group or professional issues committee that brings both sides together for dialogue between teachers and administrators. “A professional issues committee gives teachers a voice in the process to make the system more transparent and consistent,” Daenzer said. In Romeo, the local union has created a new position of “Evaluation Liaison” to mediate communication between educators and district administration, said Jen Raicevich, a math and science teacher and building representative who has taken on the role. For more information or to schedule an evaluation training, contact your local MEA field office.